Today is yet another day for updates. Amidst several news sources who are still barely reporting on the tsunami debris that washed up months ago, there are in fact some new events that are worth reporting. On Saturday, October 6th, Peter Grillo, the captain of a tuna fishing vessel, spied a boat floating capsized 700 miles offshore of Oahu. He towed the vessel back to the dock, and cleaned the intact boat of barnacles. The boat was clearly Japanese, and tested negative for radiation. Upon gathering further information on the boat, the previous owners were in fact contacted. However, they didn't appear to show any interest in having their skiff returned. A tsunami evacuation drill is to be conducted in the South Beach area of Newport, Oregon on October 11th at 10:18am. This is mainly for folks at the Hatfield Marine Science Center and those who live and work in the South Beach Area. Traffic will be stopped as the entire Newport bridge will be temporarily shut down (10:30am to 10:35am). Participants will be presented with a number of obstacles, and will muster at Safe Haven Hill, near the HMSC campus and Newport Aquarium. A second drill will take place on October 18th, in collaboration with the Great Oregon Shake Out. This will explore an alternative evacuation route to the Oregon Coast Community College. Great Oregon Shake Out- Stop, Drop, and Hold! 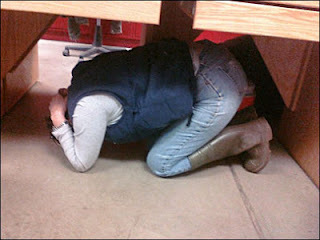 On October 18th, more than 99,000 Oregonians will participate in an earthquake/tsunami drill at 10:18 in the morning. This event was organized to promote earthquake awareness and disaster preparedness statewide. Visit their website for more information, and to register yourself or your organization. 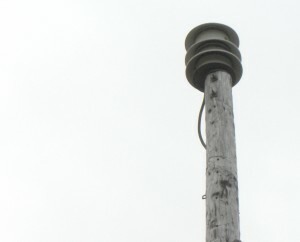 The battle for the tsunami sirens in Tillamook, Oregon has been raging for months, and the decision to disable them has finally been made. The argument against the sirens is that they will likely be wiped out and useless in the case of a local earthquake. Other critics argue the sign to evacuate will be obvious- the earthquake itself. The sirens have been touted as 'World War II' technology with obscure parts, and are being replaced by newer innovations such as reverse 911, Facebook, emergency texts, or other methods. However, not everybody is on board with this. Resident Ocie Johnson argues that the sirens are fail-safe in the case of a distant tsunami, and that the elderly do not always have access to certain sources, such as Facebook or text messaging (a good point). Somewhat ironically, Johnson started a Facebook group, 'SOS Save Our Sirens in Tillamook County' to spread support for keeping them. Despite Ocie, and other petitioners' best efforts, the sirens are due to be retired on January 1, 2013. Only time will tell whether this will be detrimental.